3-A Approved Pt100 Temperature sensor with M12 connector for quick and reliable IP67/68 electrical connection. M12, 4-Pin Connector Allows for Quick and Easy Installation. 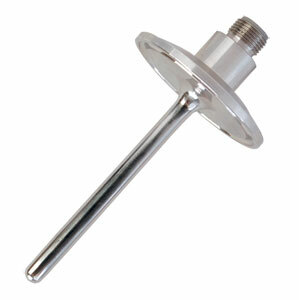 Probe Lengths of 3", 4", 5" or 6" Available from Stock, Other Lengths Also Available. The 3-A Approved OMEGA™ PRS-S-M12 and PRS-H-M12 Series RTD Sensors are designed for use in Sanitary or Hygienic Clean-in-Place applications in the Food, Dairy, Beverage and BioPharmaceutical industries. These sensors are manufactured with 316L stainless steel housings that meet the dimensional and finish requirements of 3-A Standard 74-03 and ASME BPE-2007, and are welded and processed to provide a clean, smooth, 32 microinch or better surface finish in the wetted areas for Clean-in-Place processes. A 4-Pin M12 Connector provides a quick and convenient connection point for process wiring. This M12 connector style sensor is also available in Thermistor element configurations in order to accommodate a wide variety of input requirements. For standard duty probe lengths longer than 6", change "-0600" in model number to the required length (example: 12" = "-1200", 9¼" = "-0925"). For heavy duty probe lengths longer than 6", change "-0600" in model number to the required length (example: 12" = "-1200", 9¼" = "-0925").